If you’re not from around here, you may not know that we who call North Carolina home are commonly referred to as Tar Heels. In colonial times, North Carolina settlements were a major source of pitch and tar, derived from pine trees and used to seal the hulls of ships. So widespread was the production of tar that North Carolinians acquired the nickname tarboilers. Tar boiling being dirty, smelly work, the nickname was seldom used as a compliment or term of endearment. That all changed, the story goes, during the Civil War when troops from North Carolina earned a reputation for holding their ground, while their Virginia comrades would turn and beat it. Their comrades, our boys maintained, might stick and fight better with some of that North Carolina tar on their heels. General Lee agreed. So impressed was he with the North Carolinian grit that he quipped: God bless those Tar Heel boys! The name tar heel, you might say, stuck. 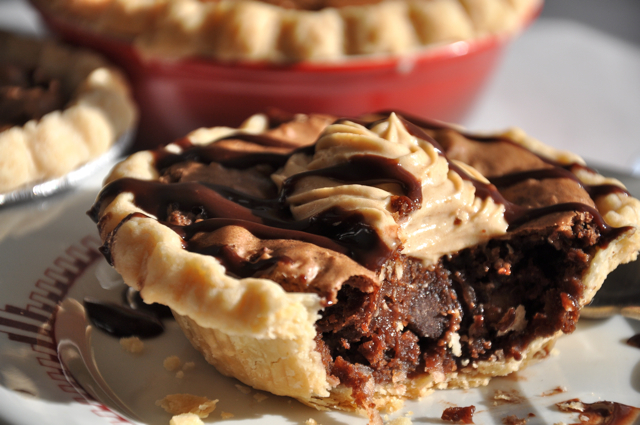 It’s not too much of a leap to venture that what we call Tar Heel pie – essentially, a brownie pie – derives from a certain resemblance between brownie batter and, well, tar. If there’s a better explanation, I’m all ears. Some might argue that brownies are good enough on their own, without a crust, but only someone who has never actually tried a brownie pie. The crust confers status – it says this is no mere brownie – and adds a contrasting tone and texture. It also allows for a decorative flourish at the edge, elevating the brownie’s overall appearance. And, oh yeah, it tastes really good, too. But don’t take my word for it. 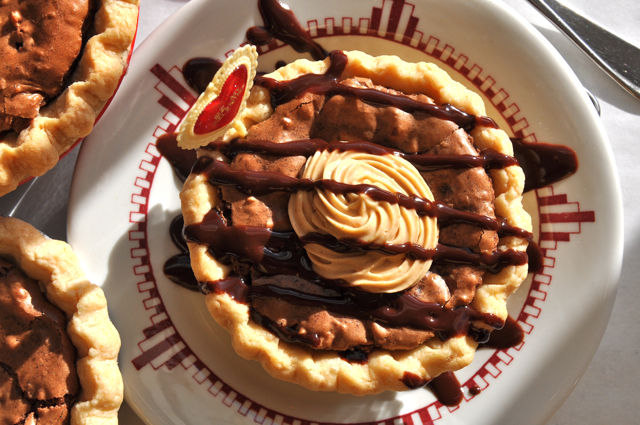 There’s only one way to appreciate Tar Heel pie, and that’s to make one yourself. Better yet, make six mini ones, like I have here, and spread the love around, this being an opportune time since today is Valentine’s Day, though no one will much care if theirs shows up later this week, or this month, or sometime after Memorial Day. This is a pie for all seasons and reasons. 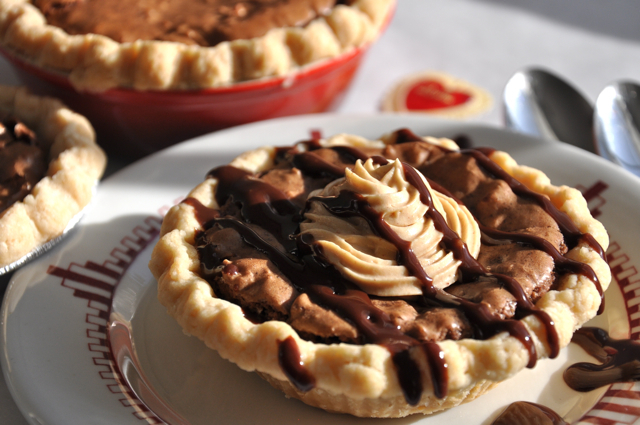 Dense, moist and fudge-like, Tar Heel pie loves a scoop of vanilla ice cream and perhaps a drizzle of chocolate or caramel sauce. But if you want to serve it with an out-of-the-box garnish, let me recommend this Peanut Butter Whipped Cream lightly sweetened with maple syrup. It combines two of the most compatible flavors known to man, whipped into soft clouds and enhanced with my absolute favorite sweetener. You’ll love it as much as I do. Happy Valentine’s Day from North Carolina, and best wishes to you. WORKING NOTES: This can be made as one standard (not deep-dish) 9-inch pie, or – as I have here – 4 or 6 small pies. The yield – the number of pies you’ll end up with – depends entirely on the size and capacity of your pans. The mini pans I prefer are the disposable foil ones measuring 4 1/4″ in diameter and about 7/8-inch deep. You’ll get six of those from this recipe. Typical individual metal or ceramic pans are closer to 5″ wide and 1 1/4″ deep and hold about twice as much batter. You’ll get 3 or 4 of those from this recipe. In either case, even though it adds a step, I suggest prebaking the pie shells as directed. Otherwise, the brownie may be done before the crust is finished baking. Finally, if you’re making one pie out of this, instead of smaller ones, use a standard 9″ pie pan, not a deep-dish one. You will probably have leftover dough. Remember to refer to the Table of Contents if you need pie pastry recipes. If you haven't already, prepare the pastry and then divide it into 4 to 6 pieces, depending on the size of your mini pie pans. (See Working Notes above.) Roll each piece into a ball, then flatten them into 1/2-inch thick disks. Place them on a plate, cover with plastic wrap, and refrigerate for at least 30 minutes. Get out your pie pans and set them aside. Working with one piece of dough at a time on a lightly floured surface - and keeping the others refrigerated - roll the dough into a 6" to 7 1/2" circle, depending on the size pan you're using. Line one of your pans with the dough, shaping the overhang into an upstanding ridge. Flute the edge, if desired. Poke the bottoms several times with a fork. Place the pie shell in the freezer and repeat for the other pieces of dough. Freeze for 30 minutes. Preheat the oven to 375°. While the shells chill, get out as many flat bottom coffee filters as you have pans. Or, instead of filters, cut that many squares of foil - about 7" squares for smaller pans, and 9" squares for slightly larger ones. Press the filters or foil squares into the shells, so they fit tightly, then add enough dried beans to each one to come up level with the top of the pan. Place these pans on a large baking sheet. While the shells cool, make the brownie filling. Melt the butter in a medium-size saucepan over low heat. When it has melted, turn off the heat and immediately add 1 cup of the chocolate chips to the pan. Swirl the pan so the hot butter runs over the chips. Set aside for 5 minutes, to melt, then whisk to smooth. Scrape into a bowl and cool for 10 minutes. In a separate bowl, whisk the eggs, sugars, and vanilla until evenly mixed. Whisk in the cooled chocolate mixture. Add the flour and salt and stir briskly, until evenly combined. Stir in the pecans, coconut, and remaining 1/2 cup chocolate chips. Divide the filling evenly between the pie shells. Put the shells back on the baking sheet and bake until the filling has puffed up slightly and developed a few cracks, 35 to 40 minutes. Transfer the individual pies to a cooling rack. Serve barely warm, or at room temperature. Refrigerate the leftovers - which will keep for at least a week - but serve slightly warm or at room temperature. MAKES 4 to 6 INDIVIDUAL PIES. PEANUT BUTTER WHIPPED CREAM - Using an electric mixer, beat the cream until it starts to form soft mounds. Add the peanut butter and beat until it is evenly mixed. Add the maple syrup and beat until properly whipped; do not overbeat. Refrigerate until using.